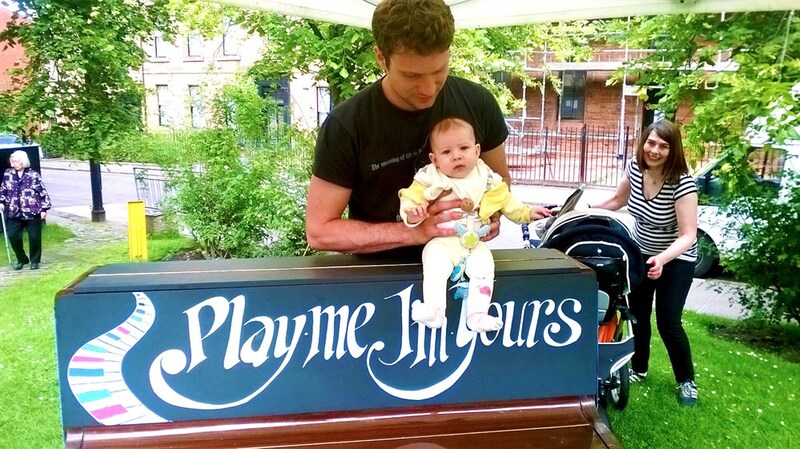 Bringing Play Me, I'm Yours to Scotland, for the first time, during the 2014 Commonwealth Games in Glasgow ~ from July 23rd to Aug 3rd and spreading a new appreciation of acoustic pianos citywide. There will be around 15 Pianos located in venues around the city for the 11 days of the Games. Pop-up pianos will tour other sites and at various locations along the route of the Queens Baton Relay for 4 days prior to the Games. We are also inviting venues with high quality instruments to open their lids and give free access to the public in a new series of ' Lids Open Days '. New rear panels will be fitted to many of the pianos to allow for more decoration area and make them ' in the round '. 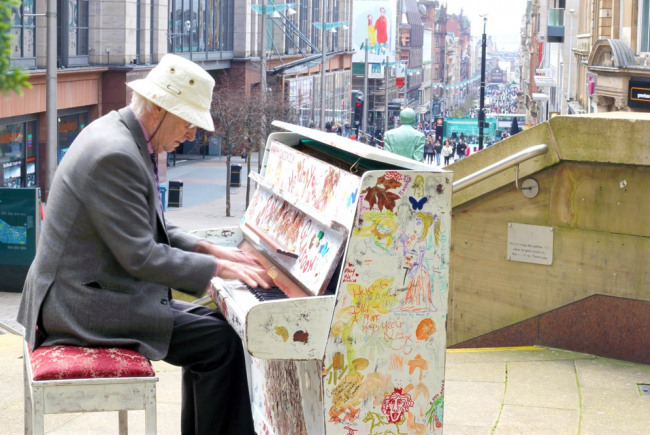 We will gather pianists of all ages & abilities, encouraging Glaswegians to have a go and ~ Gaun Yersel ! 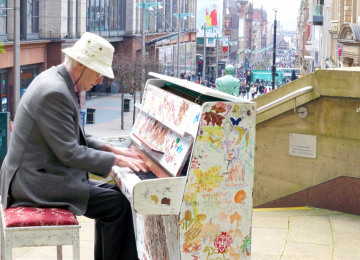 We will invite local schools, artists & community groups to decorate pianos. Our lives are so full of ' busyness ' these days. 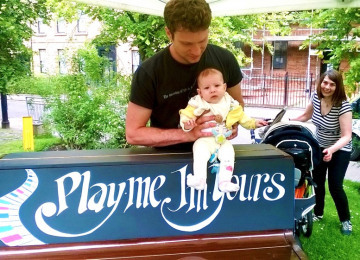 A decorated Streetpiano is an invitation to pause . . . in the midst of life and to play freely and listen to each other. It is a welcome permission ~ to have a wee breather and enjoy something we can easily lose touch with . . . music. Many of the pianos we will be using were unused and would have been discarded well before they needed to be. The Pianos will provide a legacy beyond the Games as they find new homes in friendly venues and community events for as long as they are playable. Beyond that they will be up-cycled as much as possible and continue to be a creative catalyst. Lids Open Days are proving to be a very welcome event and one that will hopefully grow beyond Glasgow this year. We have been awarded £10K from the National Lottery funded Celebrate Program - help us get beyond the finish line! We have been preparing for 6 months to ensure that all host venues are on board and pianos are ready to be installed. Main Installation venues include: Govanhill Baths, Glasgow School of Art, the Gallery of Modern Art, Kelvingrove Art Gallery, the Burrell Collection, Riverside museum, Scotland Street School Museum, the Mitchell Library, GalGael, Art Village, An Clachan Cafe, the Royal Conservatoire of Scotland, Glasgow Green and the Merchant City. There will be a special one -off event with street pianos in George Square, in the city centre, on July 28th. 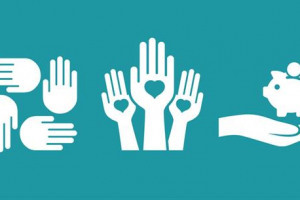 We are a community group, not a business or a charity, aiming to cut through some of life's red tape, to bring more music fun and pianos to our city streets, parks and public spaces. 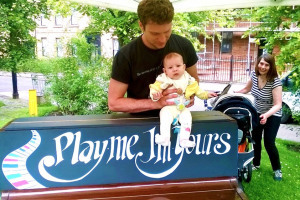 We will present the Streetpianos of Play Me, I'm Yours, the internationally touring Artwork by British Artist Luke Jerram, during the Commonwealth Games celebrations in Glasgow, from July 23rd to Aug 4th. Lids Open Day ~ a new initiative born in 2013 at the City Halls, where people of every age & ability get the chance to play high quality acoustic pianos in sometimes grand places, always free. We have run events on the Steinway Concert Grand Pianos in the Grand hall and the Recital room at City Halls, Pollok House near the Burrell Collection and on the lovely Daneman Grand piano in the Mitchell Library. We intend this event to run & run and hopefully grow Scotland wide. This event is not primarily about entertainment or performance based. Instead, the emphasis here is on quality of contact with the instrument. Wherever possible, and depending on the realities of each host venue, we also aim to offer participants a choice about whether you want a small audience of family and friends, some informal tuition ~ or if you would simply like to enjoy your 15 minutes of quality time with a great piano without any other ears around. 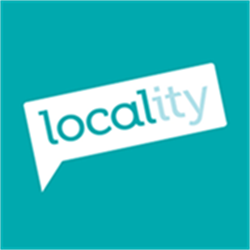 Project Delivery Manager: Glasgow Piano City The Project Delivery Manager takes legal responsibility for receiving and spending the funds raised and ensuring the project is delivered. Contractor: Glasgow Music The team responsible for building or installing the project.